Helpful tips to ensure the best buys. Buying bed sheets can be complicated and can leave shoppers feeling pretty confused. While we may not be able to spring forth with a Webster's quality meaning of the word "percale," we do know we like soft sheets or that we hate wrinkles. To help whittle down the confusion of buying sheets, let's work with what we do know first. What Size Sheets Do We Need? Nothing is more disappointing than to get home and make up your bed with your new sheets, only to find out you have to be a weight lifter to lift the mattress in order to get the sheet to fit firmly across the bed. Experts say that to avoid this problem you must measure your mattress to ensure a proper fit. An easy way to measure your mattress is to take a piece of cardboard and stick it between the mattress and box springs, then place another piece of cardboard on top of the mattress and measure the distance between the two. If you normally use a pillow-top mattress or any other kind of covering with measurable width, leave it on when you do your measurements. Fitted sheets, which have elastic going all the way around, are more expensive, but are well worth the extra money. They fit snug as a bug over your mattress and do not move around if you toss and turn at night. Second choice would be sheets designed with elastic running along the sides. Last choice are those with just the elastic in the corners. The next thing to decide is what kind of feel you like from your sheets. Do you enjoy super soft sheets which seem to get better with age? Is your preference a clean, crisp feel? Do wrinkles drive you mad? If softness is your main priority, then 100 percent cotton sheets are a good choice. There are different types of cotton and thread counts which will determine the quality of sheets you purchase. Generally, the higher the thread count, the softer to the touch the fabric will feel. 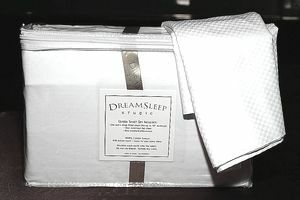 If your preference is to have wrinkle-free crisp cool sheets, than cotton blends are the best choice. Cotton and polyester blended sheets still lead the pack in consumer preference. They are generally more cost-effective and hold up well to repeat washings. Polyester has come a long way since the 1970s and now can be made to feel luxurious and soft when blended with cotton and other fine fabrics. Manufacturers will advertise the best thing about their products. You may see Egyptian cotton written all over the package, but when reading the small print, you may discover it only contains five percent of the finest fibers. Egyptian Cotton: Long-staple variety from Egypt with fiber length of around 1-3/8 inches, known for its luxurious softness. At one time, Egyptian cotton sheets were sold primarily in the more expensive stores, but today you can find them in most linen departments. The longer the fiber, the more luxurious and durable the grade of cotton. Pima cotton: Known for its strength and durability Pima cotton was developed in the Southwestern US by careful breeding of Egyptian cottons with fiber length averages of 1-1/2 inches. SuPima: This is a certification mark used by members of the SuPima Association of America and certifies that the fabric is 100 percent Southwestern cotton grown by members of the association. Thread Count: This term refers to the number of threads per square-inch of fabric and determines the softness and durability of the item. Sateen: This has a stitch of four over, one under, placing the most threads on the surface. This makes the material lustrous and smooth, although not as durable as other weaves. Pinpoint: This is a stitch of two over and one under. It is very durable, but not as soft as other weaves. Percale: This term is used to indicate that the sheets have a thread count of 180 or higher.